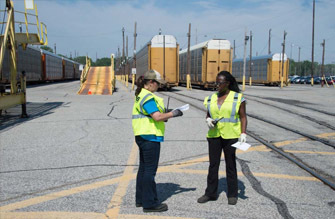 As a freight rail transportation company, Norfolk Southern’s success hinges on customer service. NS’ daily goal is to provide on-time, consistent, and reliable delivery of customers’ goods, which helps them achieve their business goals. After a challenging 2014, NS returned service levels to near record-best highs in 2015. As a result of ongoing operational improvements, NS boosted its fourth-quarter service performance by double digits compared with the same period in 2014. To ensure customer expectations are met, NS uses three primary performance metrics – composite service, train speed, and terminal dwell. They offer a good overview of how well the company is meeting schedules and using assets. The metrics are updated weekly and shared with employees across the company, allowing the workforce to track progress and performance. All NS shipments have a trip plan, similar to an itinerary for an airline flight. 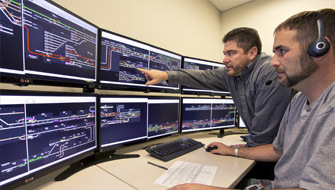 Composite service performance combines three metrics: the percentage of trains arriving on time as scheduled on the trip plan; the percentage of customer carload pickups and set-outs executed as scheduled; and the percentage of customer carloads making scheduled connections for delivery. Train speed provides a view of how smoothly and efficiently trains move across the network. A high-velocity network improves customer delivery times and lowers operating costs. For example, the company needs fewer locomotives and rail cars to move the same amount of freight and can add network capacity without building additional tracks. NS moves freight cars safely and as quickly as possible to achieve on-time delivery. As they move across the system, freight cars are classified and assembled into trains at terminals based on destination. Dwell time measures how long they remain in a terminal before departing on an outbound train. The shorter the time, the better. 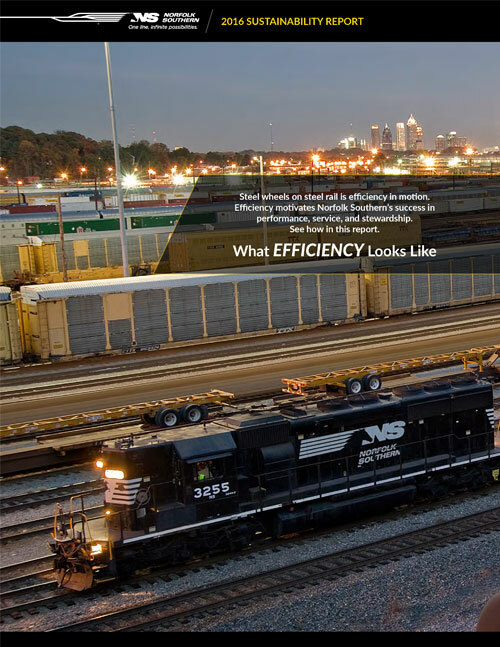 From yard expansions and innovative technologies to a new locomotive reliability team, Norfolk Southern in 2015 continued to take action that improves customer service and the company’s long-term sustainability. 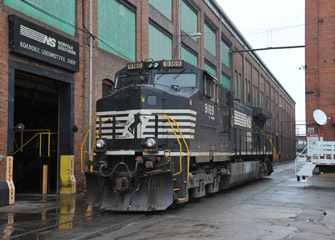 Norfolk Southern began implementing network changes to take advantage of a $160 million expansion completed in late 2014 that nearly doubled the size of Moorman Yard in Bellevue, Ohio. Now capable of handling 3,000 rail cars daily, the facility has enabled NS to reduce car handling and switching, route miles, and delivery times – by as much as two days for some customers. The Bellevue terminal, NS’ largest “hump” classification yard, is strategically located along a rail corridor that connects consumer-rich markets between Chicago and New York. The expansion has enabled NS to consolidate car handlings into fewer yards and to build longer trains. In one measure of efficiency gains, car handlings in 2015 were reduced by nearly 200 cars a day, generating annualized savings approaching $14 million. Bellevue’s added capacity has created opportunities to grow business volumes across NS’ Northern Region and in other key network hubs. It also has improved network resiliency, providing more flexibility to reroute traffic and minimize delays during winter storms affecting Chicago and the Northern Region. NS’ intermodal network links shippers to supply chains that span the globe, providing safe, fast, and efficient rail service to ocean carriers, third-party logistics firms, truckload, less-than-truckload, and parcel carriers. As intermodal volumes grow, NS continues to improve processes, employ innovative technologies, and make strategic capital investments to increase capacity and enhance service. In 2015, NS completed an expansion of its Rutherford Intermodal Facility near Harrisburg, Pa., adding new loading, unloading, and support tracks and increasing parking capacity to handle more traffic volumes. NS also completed improvements to its Calumet Intermodal Facility in Chicago, including adding a lift track, support track capacity, and parking. These enhancements improve NS’ ability to serve customers in the nation’s busiest rail hub. NS began rolling out technology upgrades in 2015 that make doing business with the railroad easier and faster. The single largest effort, scheduled for completion in early 2017, involves a redesign of accessNS, the company’s main customer e-commerce portal. Another significant initiative is the railroad’s new optimized intermodal terminal operating system, including an industry-first mobile app for drayage truckers. At automotive distribution facilities, NS began installing a high-tech optical scanning system that gives auto customers and drayage drivers a real-time view of vehicle shipments. To ensure these next-generation technologies meet customer needs, NS put customers in the driver’s seat. The company used customer surveys, recruited shipping company volunteers for input on user experience, and rode along with drayage truckers at NS intermodal facilities in Chicago and Atlanta to better understand their needs and concerns. 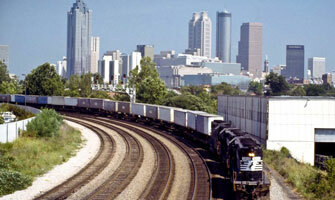 Learn more on the corporate website about ExpressNS and NS intermodal services. In 2015, Norfolk Southern introduced ExpressNS, an industry-first mobile phone app that speeds truck drivers’ pickup and delivery of trailers and containers at NS intermodal facilities. These drayage truckers provide valuable first- and last-mile service for customers’ freight. Moving them through NS’ intermodal facilities more quickly means less idling, reduced fuel burn and costs, and reduced carbon emissions. The mobile app and other technologies improve operating efficiencies at intermodal facilities and make them “greener.” These improvements include express lanes and automatic gate systems outfitted with high-resolution cameras and optical scanners for faster, more efficient processing of drayage trucks. A new locomotive reliability group formed in 2015 has one mission: to keep locomotives on the road and out of repair shops. Based in Atlanta, a group of four teams helps mechanical shop employees diagnose locomotive troubles and reduce repeat locomotive failures. NS based the concept in part on a model developed by Delta Air Lines to assist its airplane mechanics with repairs. 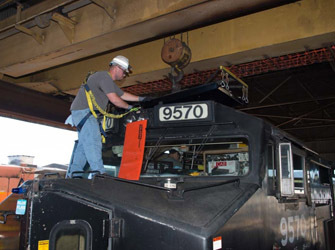 Locomotives have event recorders – similar to an airplane’s “black box” – that shop personnel can download and send to the reliability teams to troubleshoot problems. Each team specializes in one of NS’ four primary road locomotive models. Since forming the group, NS has seen a drop in repeat locomotive failures and an increase in the mean days between repair-shop visits for individual locomotives. 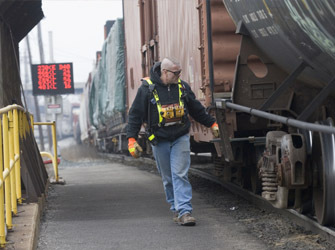 Each team has developed standardized work procedures that provide a checklist for shop employees to follow when a locomotive arrives for repair and before it re-enters service. A rebuild program to convert aging Dash 9 locomotives from DC to AC power, a process that transforms the 1990s and early 2000s units into like-new locomotives at about half the cost of buying new. Using AC-powered traction motors boosts the locomotives’ pulling power, particularly at slow speeds, and enhances fuel efficiency. NS owns about 1,200 of the Dash 9s, currently comprising nearly half of the railroad’s long-haul road fleet. A plan to purchase 50 new AC locomotives, including 47 units in 2016 equipped with Tier 4 emissions technology, meeting EPA’s latest and most stringent emissions standards. GE Transportation, the locomotive manufacturer, says the high-performance locomotives cut emissions of nitrogen oxides and particulate matter by at least 70 percent compared with Tier 3 locomotives – one more way that NS helps customers reduce their supply-chain emissions.